REALTOR® C. Edwin (Ed) Shields was first licensed as a salesperson in 1956 and immediately joined the sales division of the Butler County Board of REALTORS®. 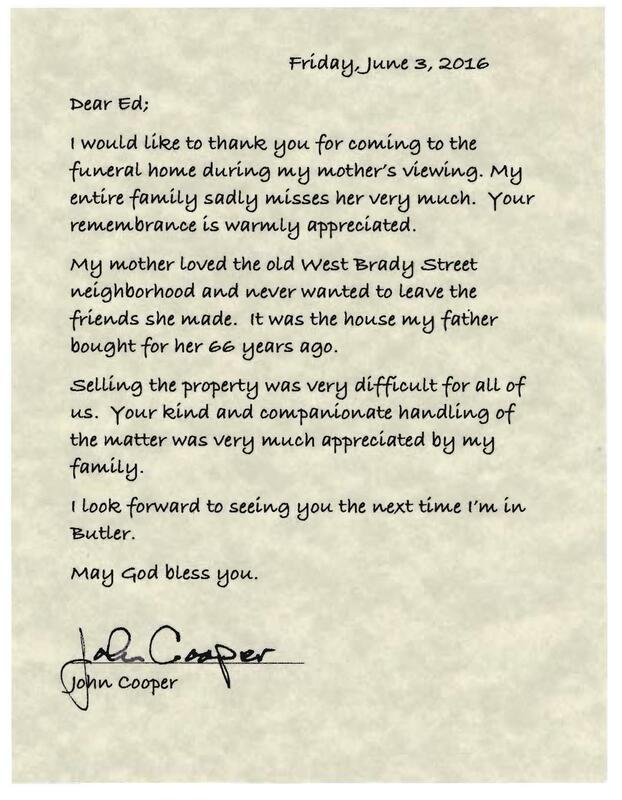 His father, a REALTOR® since 1945, purchased a large Victorian building on Main Street in Butler for combined home / offices and Ed grew up in the business, selling real estate in the summers and during holidays while attending the University of Pennsylvania. Upon graduation from the Wharton School at the University of Pennsylvania with a major in real estate he passed the state brokers exam in September of 1958 and joined the Butler County Board as a REALTOR® (only brokers could be REALTORS® until mid 80's). He became active in Board activities and was elected President in 1962 (still the youngest president of the Board) and re-elected President in 1963. He initiated the mandatory indoctrination course, and was chairman of the Board Multi-List. He was awarded REALTOR®-of-the-Year in 1966, and also REALTOR®-of-the-Year in 1981. He became active in the Pennsylvania Association as director and served on Legistive Steering, Speakers Bureau, and Education Foundation Committees. He also was named regional representative of N I R E B (National Institute of Real Estate Brokers, predecessor to RNMI), He was elected regional Vice President of the Pennsylvania REALTORS® Association for 1967 and 1968, re-elected to the position for 1969 and 1970 and was elected Senior Vice President for 1970. At the Butler County Association of REALTORS® he has chaired most committees over the years and currently is director and co-chairman of the Professional Standards Committee. The Pennsylvania Association of REALTORS® currently finds him as director and a member of their Standard Forms Committee. He is currently a non-resident member of Allegheny-Kiski Area Board of REATLORS®, and a non-resident life member of the REALTORS® Association of Metropolitan Pittsburgh. Besides various seminars offered by NAR, Mr. Shields has been the local association's delegate to many national conventions including 1969 in San Francisco with a post convention trip to the Hawaii State Convention; he had the privilege of shaking hands with President Gerald Ford at the MGM Hotel in Los Vegas in 1976; and, while attending the NAR convention in New York in 1986 he won the grand prize drawing trip to the 1987 national convention in Honolulu. He attended the first three one week yearly GRI classes in Pennsylvania beginning in 1970 and was a member of the Charter Pennsylvania GRI class (1972); in January of 1973 he was awarded the professional designation CRB - Certified Residential Broker - one of the first in Pennsylvania; in 1978 he became a Charter member CRS - Certified Residential Specialist. In 1971 Mr. Shields opened his own brokerage office under the name of Ed Shields REALTOR® and has had his main office at the same location for the past 35 years. Attached is letter of admission to the Butler as Designated REALTOR® (for his business). He has had as many as 4 branch offices at one time, but currently only operates 2 branch offices. He has been an instructor for many real estate courses at the Butler County Community College since it first opened 40 years ago, and he has also taught for Penn State University, Duquesne University and Slippery Rock University. Following are some of his activities and accomplishments. 1. Former manager for Veterans Administration.2. Former manager and regional listing broker for HUD (United States Department of Housing and Urban Development) acquired properties).3. Past member of the Butler Township Planning Commission for 4 years.4. Community Development Corporation of Butler County - Board of Directors, for over 20 years.5. Past Chairman of Sparkplugs Committee of the Butler Area Chamber of Commerce.6. Past Director Butler Area Chamber of Commerce.7. Past President, Butler Chapter, International Management Club.8. Past President, Early Birds Toastmaster Club.9. Director and Current President of Midwestern (PA) Economic Education Free Enterprise Foundation.10. Legion of Honor, International Order of DeMolay.11. National Eagle Scout Association.12. At his Church he has been a Deacon, Trustee and teacher. He currently is Chairman of the Finance Committee, Investment Advisory Committee, and President of the ushers.13. Community activities: United Way, Kiwanis Club, YMCA, and Hospital fund drives, Boy Scouts, Girl Scouts, Red Cross and others.